I’m writing from yet another airport, staring at my bags of gear strewn around me and listening to the chatter of travellers sipping their overpriced Starbucks coffee and complaining of travel delays. If I closed my eyes for long enough, I might forget which airport it is that I’m sitting in. Hong Kong? Brisbane? New York? Vancouver? This will be my fourth continent in two weeks and my body is absolutely exhausted (with a fifth likely to come at the end of the month – more on that later). In between travelling (and running), I’ve been going through more rounds of job interviews at weird hours, sitting job-related written tests, and trying to get out an academic article on the side. I barely know what day it is, let alone time zone, and my head is in a billion different places. But it is time to get focused. I’m currently en route to the ICE Ultra in Swedish Lapland (with any luck). Storms throughout the northeastern US have sent my flights into chaos, but with any luck I will still make it there. I have made it to Frankfurt and should land in Lulea, Sweden sometime this afternoon and then transfer to base camp in Kvikjokk! The race is 230km over just four stages, which is considerably shorter and more intense than the other multi-day races in which I have competed. All of the stages are longer than a marathon and the longest stage reaches a whopping 90km. It is a self-supported race, meaning that competitors are required to carry all of their essential clothing, food, and medical supplies on their back. And the equipment list is seriously intense, including everything from green needles and scalpel blades to face masks and snowshoes. The only saving grace is that the race organizers are transferring are majorly bulky gear, such as a -40C-rated sleeping bag and warm dry clothing, in between camps for us, negating the need to pull a sled around the course. I’ve only had a few days since returning from Hong Kong and Australia to put my gear together, which has consisted of equal measures of panic and hilarity. I have discovered that ripping up old pillowcases to try to make a triangular bandage is not nearly as effective as sewing together pieces of cheesecloth (much lighter and takes up less space). Asking a pharmacist for scalpel blades requires a rather lengthy explanation, and once you say “I need them for a race through Swedish Lapland”, he or she will immediately assume you are incapable of handling sharp objects. I’ve learned that tampons make great fire starters and rolos are easier on the teeth than mars bars in cold climates (the caramel insides won’t freeze). I’ve also discovered, to my dismay, that my running shoes are most definitely too tight, which means that I will be heading into frostbite territory during the race. On the plus side, I’ve tested out wearing different ridiculous fuzzy hats around town (erm, and around the bars in Hong Kong) and found that with the right smile, they might just be possible to pull off in even the most fashionable of settings. 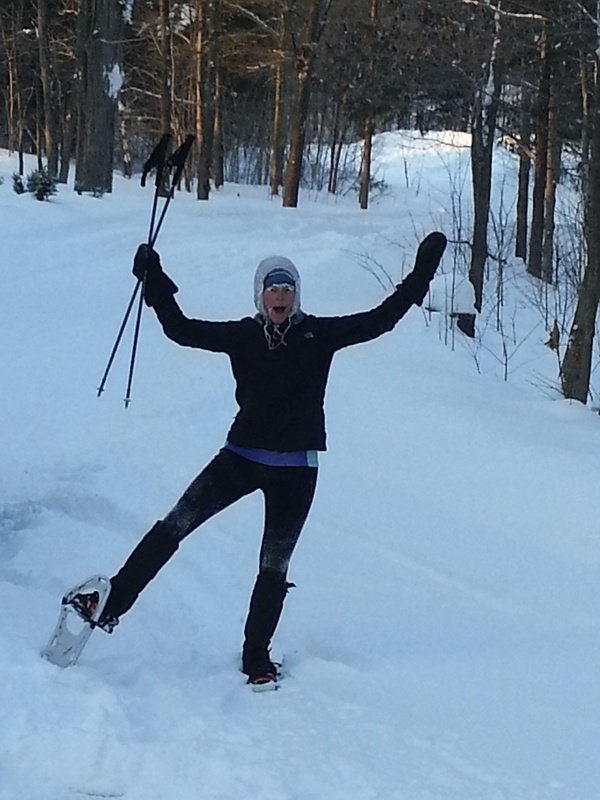 But the most fun I’ve had over the past week has been testing out my new running snowshoes. My god, if you don’t have a pair, BUY SOME. Even if you don’t have snow. Because they simply rock. 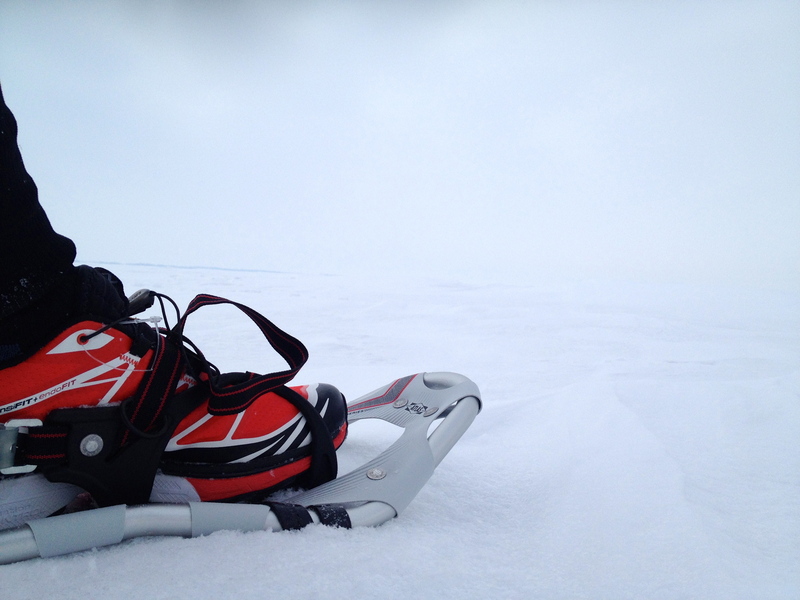 A couple of times this week I strapped on my shiny new and slightly modified tennis rackets and headed out on the frozen lakes of Canada for a little snowshoe practice. I was expecting them to be extremely clunky and awkward, but to my delight, they were entirely manageable. Running snowshoes differ from regular snowshoes in that they are narrower (to allow for less bow-legged running) and lighter (to reduce the load on the legs). The ones I’m wearing – Atlas Run – have spring-loaded suspension and quick release bindings, which make for some serious fun hopping around the snow. I had visions that my snowshoes would allow me to gracefully skirt along the top of the snow, gliding along like a winter gazelle, smiling and waving at the wildlife as I trotted along. As it turns out, snowshoes really just allow you to sink into the snow at a slower rate and leave bigger holes behind. Instead of mimicking a graceful winter gazelle, I think I channeled a slightly disabled polar bear, crashing and careening around, kicking up snow all around me. And hysterically laughing the entire way. When you race in the desert, you have to learn how to read the sand. You need to be able to figure out where the hard spots are and where the sinkholes are, and hopefully avoid the latter. Running through the snow is the same and unfortunately I have not yet mastered this technique. I may be attempting to read the snow, but it appears to be written in another language. I am stumbling over molehills and fumbling my way into surprise snowbanks. But I figure that I have a full 230 km to sort it out! Why am I doing this? It is a good question. I hate the cold. I always have. But hey, once you’ve conquered desert races and mountain races, aren’t the arctic races the next step? And as the quote says, perhaps it will make me appreciate the warm all that much more. And it seems that my next move may be to somewhere much, much warmer… But I’ll save that for a post after the race is done. One adventure at a time! Please, please do send messages of support to me during the race. Just email theiceultra@gmail.com. The more, the merrier!!! Jokes, quotes, simple words of encouragement… Anything helps. You can follow along with updates on the race blog, facebook and twitter. Last request – if you like following my blog, please consider nominating me for another top blogging award from BreakingMuscle! I need to be among the top twenty nominated in order to go to the judges’ panel. Just post a quick comment here and that’s all you have to do! Wish me luck. Cross your fingers and toes I’ll make it through. Or that I’ll make it out with MY fingers and toes! POST YOUR NOMINATION TO THE COMMENTS BELOW! Include a link to the site and why you think it’s the best. But I’ll be danged if I can find anywhere below to post that comment and, hence – nominate your blog. Is it me just being a brick…? There’s a little button at the top right hand corner of the comments that says “add a comment”! It is hard to see 🙂 Thanks!! Wish you all the best! 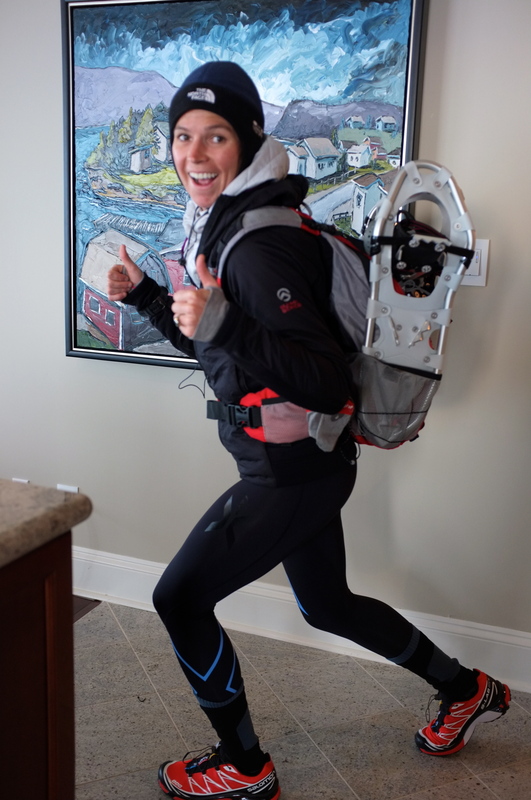 We’ve had lots of snow in Winnipeg this winter, and my sister has snowshoes and loves them! As for myself, I’m a gym runner in the winter, and waiting for spring 🙂 I’ll be following your progress at the Ultra. Wow! wish you the best, and loved the picture with your face with snow! Great pic. I love the snow and snow training looks great. Not much snow here in Oz! 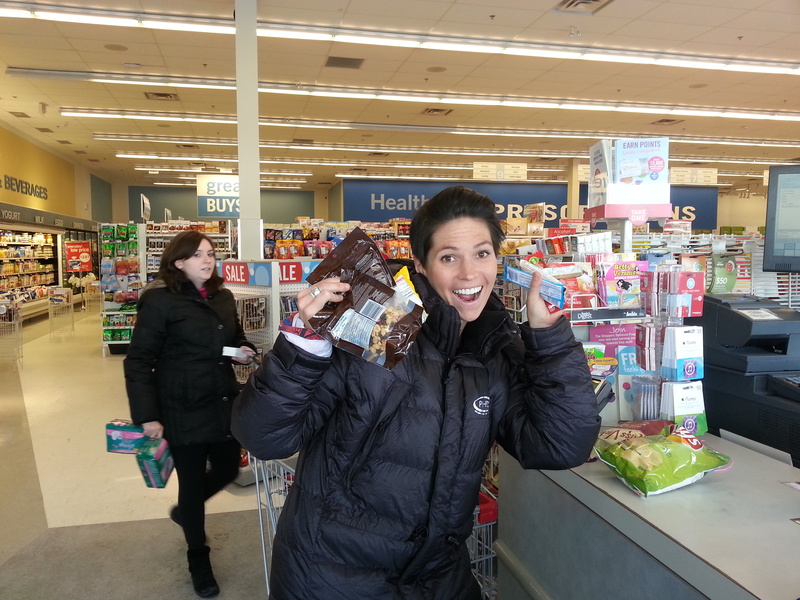 Fabulous Steph! I have been following along. Bravo Ice Queen!